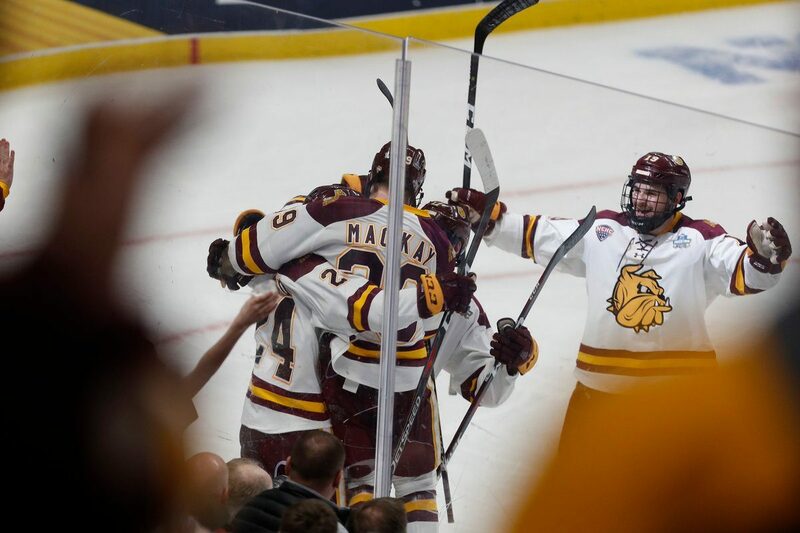 Minnesota Duluth earned those distinctions for the second year in a row and for the third time in nine years by embracing the black-hats role Saturday night at KeyBank Center and foiling fan-favorite University of Massachusetts’ bid of authoring the perfect ending to its season of firsts. The defending champion Bulldogs completed the repeat by defeating UMass, 3-0, in the NCAA Division I men’s final before a crowd of 13,624. Senior and Frozen Four Most Outstanding Player Parker Mackay set the tone early with the game’s opening goal and later picked up a huge assist. Mikey Anderson recorded a goal and two assists, while Jackson Cates added a late tally to give the UMD faithful in the house a reason to kick off their championship celebration early before the players engaged in their own on the ice. Junior netminder Hunter Shepard, one of 14 determined returnees from last year’s championship outfit, turned aside all 18 shots he faced, while his teammates put the shackles on the nation’s third-best offense by outskating the Minutemen and outcompeting them. By doing that, the Bulldogs became the first team to repeat as national champion since Denver followed up its 2004 triumph by winning it all in 2005. While UMass had the nation’s top power play and fourth-best penalty-kill unit entering the Frozen Four, Minnesota Duluth’s 15th-ranked power play broke a scoreless tie before the game was four minutes old. Mackay, parked alone in front of the UMass net, received a nice one-time pass from the point from Anderson and quickly backhanded a shot upstairs past Filip Lindberg. For a stretch, Lindberg was the Minutemen’s best player as Duluth’s speed and forecheck kept UMass from doing anything offensively. After stopping 13 shots in the first period, Lindberg turned aside the first nine he faced in the second as he did his to keep the Bulldogs from increasing their lead. UMD even had two breakaway chances in a span of a minute to extend its lead but failed to do so as the first attempt by Nick Swaney sailed high and the second try by Justin Richards flew wide. It was the 10th shot of the second period that gave the Bulldogs some breathing room and put UMass in a bit of trouble. Off a faceoff in the Minutemen's zone, Mackay saw Anderson streaking in from the point down the slot unguarded. Anderson fired a shot in the top corner to make it 2-0 with 4:12 left in the period. UMass generated few quality scoring chances, with its best ones coming during an early third-period power play. The Minutemen failed to beat Shepard, who is now 8-0 in his career in the NCAA Tournament. Cates capped the scoring with 2:42 left for Duluth, which finishes its season 29-11-2. It prevented UMass (31-10-0) from adding one more item to its season of firsts. The Minutemen won its first Hockey East regular-season title, earned their first national No. 1 ranking, celebrated their first ever Hobey Baker Award winner in Cale Makar and reached their first Frozen Four. A first national title just wasn’t in the cards against a Duluth crew that will go down in the annals of college hockey as one of the best championship outfits. Sandelin now becomes just the ninth head coach in Division I history to win at least three national championships. He joins a list that includes the all-time greats – including wins leader and five-time champion Jerry York of Boston College and the late Herb Brooks, who guided rival Minnesota to three national titles during the 1970s before guiding Team USA to the 1980 Olympic gold medal.